Gmail has added a feature to the contacts screen to allow you quickly find all duplicate contacts in your contacts database. Until I hit this button, I thought I was pretty good about managing my contact, but I found that out of more than 1600 contacts, I had 163 with more than one entry. You’ll find the new magic button by clicking on the Contacts link on the left, then in the main window labeled “My Contacts”, there are two buttons labeled “View Suggestions” and “Find duplicates”. 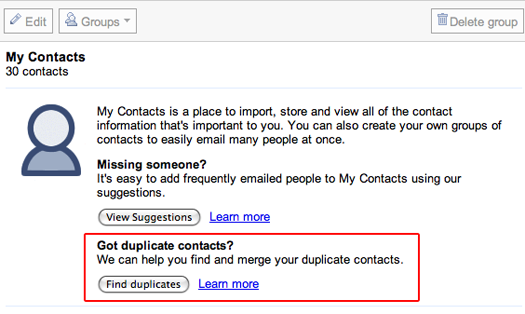 After you click the Find Duplicates button, a list of all contacts with more than one email address is presented. Review the list and uncheck any contacts you want to leave alone. Click the “details” link next to each contact to see which addresses Gmail has found for this person, or use the “expand” link at the top of the list to show the details for all duplicate records. Use the collapse link to shrink them back down to a list of names. After you have reviewed the list, click the Merge button to combine the multiple email addresses in to one contact. Verify the operation worked as expected by looking up your contacts and noting that there are now multiple email addresses for that person. Choosing a name when you compose a message is the same as if the contact was not merged. Start typing the name and all available email addresses are displayed. If you’ve been considering using Gmail as your central contacts database, this feature makes it easy to keep everything together and then sync it with your phone or other portable device. 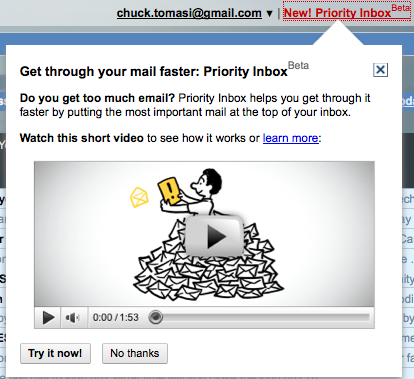 To find out more about syncing your contacts, search for the term sync on the Gmail blog at chuckchat.com. Here’s today’s quick tip – Use the question mark key (?) to see all the shortcut keys Gmail has to offer. Welcome the Gmail Podcast, a collection short hints, tips, and tricks to help you get more from your Gmail account. I’m your host, Chuck Tomasi. Let’s say you’re a typical Gmail user and your colleagues send you links to a Google document, either a spreadsheet, presentation, or regular text document. Typically, you would click the link to open the document in Google Docs. That’s a little cumbersome when all you need is a quick peek to get a few facts or figures. That’s where the labs feature called “Docs Previews” comes in handy. Like any labs feature, you can find it under setttings, on the labs tab. Enable it and save your settings. Now when you get a link to a Google doc, an option will appear on the bottom of the message to preview the document, almost as if it were an attachment. Sorry, it doesn’t allow you to preview actual Microsoft document attachments like Excel or Word. Another handy labs feature that can save you from some potential embarrassment is called “Got the wrong Bob?” This feature looks at the patterns of recipient groups you have sent to and tries to prevent you from including the wrong one. Again, like all other labs features, you can find “Got the wrong Bob?” under the labs tab of the settings screen. As a side note, be aware that the labs feature formerly known as “Suggest More Recipients” has been changed to “Don’t forget Bob”. That’s all for this time… Comments, suggestions, or questions can be sent to gpodcast@gmail.com or check the website for full information and archives of all previous Gmail tips at chuckchat.com/gmail. I have no affiliation with Google other than as a satisfied Gmail user. Thank you for listening, and don’t forget to write.